Größe dieser Vorschau: 228 × 228 Pixel. Weitere Auflösung: 240 × 240 Pixel. 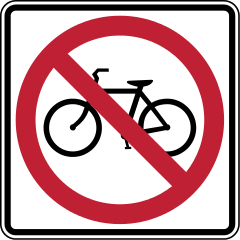 MUTCD R5-6 - No bicycles regulatory sign. From: Manual on Uniform Traffic Control Devices for Streets and Highways - 2003 Edition.